We’re heading off to some unknown planet on the Upgradium slot by Playtech. There, we’ll discover mysterious new elements that have seemingly magical properties. Finding the right combination of these materials makes them transform into more valuable ones right before your very eyes! Upgradium has a distinct look. Its background and symbol designs have been carefully styled to give the title a strong feel that we’ve left the Earth behind for this adventure in search of riches. In terms of specifics, the slot is played on a five by three gameboard. There is a total of 25 win lines that can be active at any one time on the game. It also comes complete with some rather unique bonus features. Once you understand how they work, you’ll find the title of the game itself makes a lot more sense! Cool gameplay dynamics. We can’t think of another slot that has the same upgrading symbols feature and we love to see such innovation on titles. Strong art style throughout. We love the ethereal look and feel of this slot. The background and symbol design make it feel like the action takes place anywhere but on earth! Perhaps lacking a “wow factor”. Although the game offers players a couple of unique bonus features, there isn’t that much to get excited about. For this reason, we can imagine players enjoying Upgradium for a few sessions before finding another game with a bit more going on. 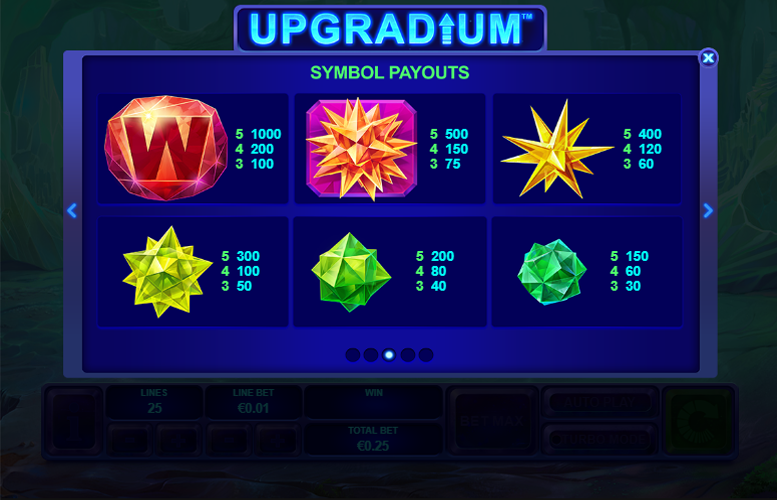 The top jackpots on Upgradium are each awarded for matching five of the same higher value symbols along one of the active win lines on the title. These high value symbols are represented by various crystals – the pointier they are, the higher the prize! Upgrading “Wild” = 1,000x the line bet. Spiked Crystal = 500x the line bet. Yellow crystal = 400x the line bet. Star crystal = 300x the line bet. Light green cube crystal = 200x the line bet. Dark green crystal = 150x the line bet. The Upgrading “Wild” symbol is represented by a red “W”. This special symbol will substitute for all other symbols. 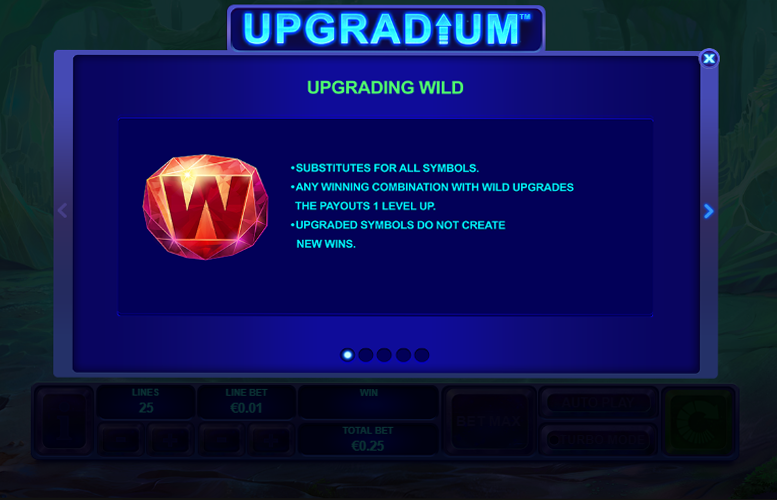 Any winning combination using one of these upgrading “wild” symbols will have the payment upgraded by one level. These upgraded symbols will not create new wins. Landing the spiked crystal symbol on a hotspot will trigger the Crystallisation Respin bonus. All symbols upgrade to the next highest paying symbol on every respin. Reels two, three, and four will become hotspots during the mode and landing an additional spiked crystal symbol on them will retrigger the feature. In addition to the higher value symbols on Upgradium, there are also those that award lesser prizes. Just like their higher value counterparts, these are represented by different crystals from deep within the alien planet upon which the action takes place. Turquoise sphere crystal = 100x the line bet. Light blue crystal = 80x the line bet. Dark blue cube =60x the line bet. Violet diamond = 40x the line bet. Pink triangle = 25x the line bet. 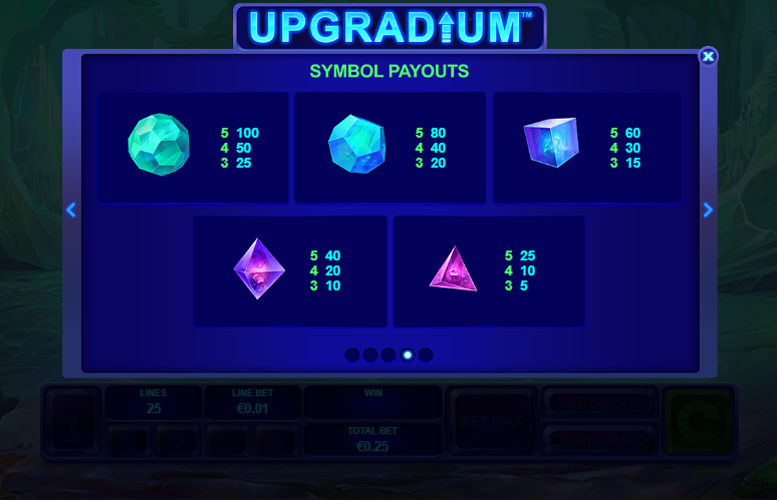 Players are given maximum control over how they choose to spread their bets out on the Upgradium slot machine. They can adjust both the number of win lines they bet upon (between one and 25) and the amount bet on each one. The minimum and maximum values here are 1p and £10 respectively. This means that with all values set to the lowest possible figure, the minimum bet per spin on Upgradium is just 1p. Meanwhile, with everything maxed out, the upper betting limit is a reasonably impressive £250. There will be a few players out there that find this betting limit overly restrictive. However, most will think that this maximum bet is more than accommodating. 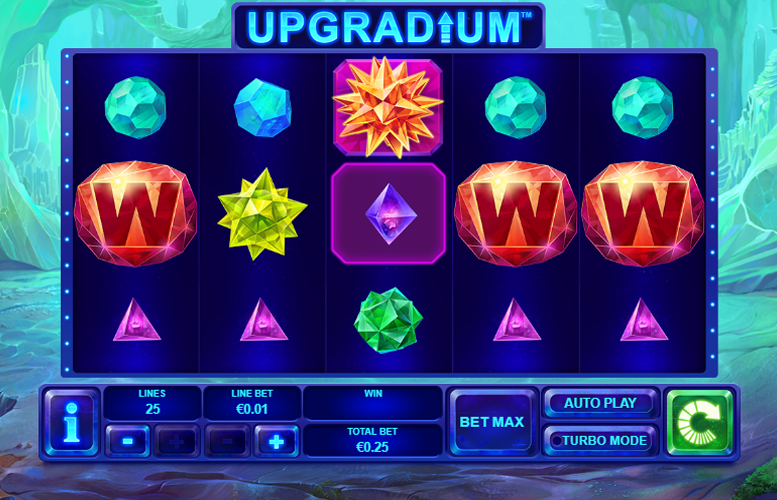 Upgradium by Playtech is a fun slot machine that has a strong visual presence and gameplay features to match. We particularly enjoyed how the design team has made the action feel like it takes place on some alien world, despite never explicitly mentioning so. We also appreciated the novel take on bonus features. Symbols can upgrade to award larger prizes whenever a “wild” is involved in a winning combination. This makes for some exciting gameplay experiences (and potentially lucrative ones to boot). The only real flaw we found with the title is a lack of a serious “wow factor”. This isn’t going to stop anyone enjoying the game, but it might mean that fewer people add Upgradium to their list of all-time favourite slot machines! This game has a rating of 4 / 5 with 873 total reviews by the users.